Most fleet managers have had a driver get into an accident at some point and dealing with the fallout can be maddening. It’s often difficult to know exactly what happened, and fleet managers want to trust their driver’s explanation, but that can be difficult to do in light of competing evidence. The best thing for any fleet manager is to have eyes on the situation. Luckily, there’s ZenduCAM; a commercial vehicle camera system that can address this problem. ZenduCAM integrates Smartwitness and MyGeotab to provide a flawless dual dash cam with GPS. SmartWitness is a British company that utilizes technology it has developed in the UK, USA, and South Korea to lead the world in designing and manufacturing in-vehicle cameras. The company claims its equipment is in 200,000 vehicles around the world, driving 35 million miles per day. SmartWitness cameras have 170 degrees field of view to capture the entire front and peripheral views of a vehicle, and additional cameras can be installed to capture driver behavior and blind spots. The cameras can include microphones for audio recording to record driver behavior and the cameras also operate automatically and are resistant to tampering. 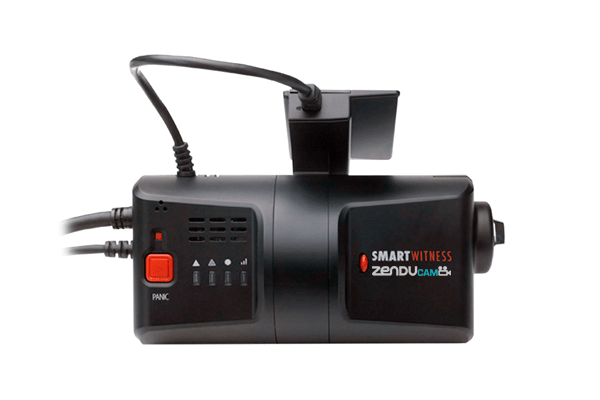 The SmartWitness commercial vehicle camera system can be integrated with numerous other systems, including brakes, reverse, horns, taxi meters, stop arms, door locks, and more. GoFleet integrates SmartWitness cameras with the Geotab telematics system in order to maximize their benefits. Geotab utilizes GPS sensors to provide second-by-second tracking of a vehicle, including when the ignition is turned on, the trip distance and time, driving speed, and time spent idling. GoFleet collects all this data into one easy-to-use interface to give fleet managers a clear picture of what is happening at any given time, and that includes integrating the Geotab data with any number of other monitoring systems. Our integrated commercial vehicle camera system allows fleet managers to monitor fleet activity via live video streaming in desktop browser or mobile device. The cameras record the events surrounding an accident and that footage can be integrated with data from other sensors, in particular speed and braking. The combined data can usually clearly show who is at fault. This can protect against false accusations and fraudulent insurance claims. ZenduCAM helps with a lot more than just accidents. The commercial vehicle camera system can be set to record entire the time before and after certain events. Examples of negative events that a fleet manager may want to record include speeding, idling, hard acceleration, and harsh braking. Fleet managers can set rules, like a maximum speed limit, and anytime those rules are violated the ZenduCAM system can automatically send footage of the violation to the fleet manager’s attention. This can greatly reduce disputes between drivers and managers. For example, a driver might claim that he was speeding just to pass another driver that was driving unsafely slow. The footage of the speeding event will usually either confirm or disprove the driver’s story. This video collected on driver behavior can be used to both proactively coach good driver behavior or be used to discipline bad drivers.